Loren's dagger holds incredible power—but something keeps her from using it. 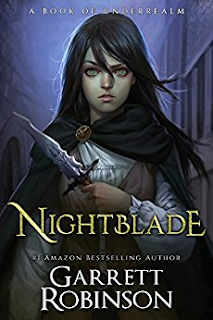 Loren dreams of escaping her cruel parents and becoming a great thief: Nightblade, a warrior of darkness and a champion of the light. Following the fugitive sorcerer Xain out of her forest home, she wears a stolen noble's cloak of fine black cloth and carries a dagger the world has not seen in centuries—a blade that can turn enemies to allies when she least expects it. If she can survive, Loren may become the most infamous thief in the world. But if she fails, she will be only the first to burn in a war that threatens all the nine lands.